Home News Brian Kelly decides to jump ship…NEXT MAN IN! Brian Kelly decides to jump ship…NEXT MAN IN! Well it’s official. Brian Kelly did what everyone thought he would do and follow in the footsteps of Mark Dantonio. The reports are out that Notre Dame will announce Brian Kelly as their next head coach, and BK will more than likely not spend a minute more with his dedicated players and team after the team’s banquet this evening. It’s a perfect ending to a perfect season in a sick kind of way. The whole year the team played with the motto of “Next Man In” almost as if Brian Kelly saw the writing on the wall months ago that he would cut and run on his team before the biggest game in UC football history. Three short seasons ago BK joined the Bearcats and coached them to an International Bowl championship, PapaJohns.com Bowl championship, then two consecutive Big East championships with a disappointing performance at last year’s Orange Bowl against Virginia Tech. BK has made the most of his players and turned the program into a national powerhouse building off of the foundation that Mark Dantonio so nicely poured for him. Now BK is off to Notre Dame where the cabinet won’t be left quite as full and the expectations not quite so low. In Cincinnati, BK was on his way to becoming a local legend and turning the Bearcats into the premier football school in the Big East with perennial BCS bowl games and National Championships on the line. At Notre Dame BK will be expected to win National Championships from the beginning and anything less will be a disappointment. The news comes on the heels of the Bearcats undefeated season where they repeated as Big East Champions and in which they came just one second or a missed field goal away from playing for the National Championship. Bearcat fans rewarded the team and BK by turning out record crowd, after record crowd at Nippert…and by selling out the team’s entire 17,500 ticket allotment to the Sugar Bowl where the Bearcats will play the Florida Gators. Add in the fact that BK’s seniors poured their hearts into a game that will go into the history books (video) against Pittsburgh in the final game of the regular season where they came from 21 points down to win in the waning seconds by 1 point. It was such an emotional and important win that senior leaders Tony Pike and Mardy Gilyard broke out into tears of joy…but who cares. BK certainly has a fat paycheck waiting on him in South Bend in addition to a slew of absurd benefits. He will also be able to play under the watchful eye of Touchdown Jesus, and be judged by fans who feel more entitled to everything and anything, without any real reason. BK will also be taking over a team that hasn’t had a defense in years, and whose two best offensive players just declared themselves for the NFL Draft. The University of Cincinnati is a top-notch school and program, and Cincinnati is not some stepping stone city. As much as I love Bearcat football, and what BK has done for it, he’s gone now and I’ve moved on. Good riddance BK, and I wish you as much luck at ND as Dantonio has had at Michigan State. 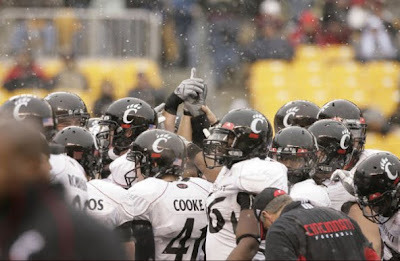 In the mean time, watch this GREAT VIDEO on the Bearcats instant classic win over Pittsburgh. It’s inspirational and the sound track is perfect given this news. BK, you’re just the past now. It’s our time. Previous articleOTR Neighborhood Holiday Party – Thursday Night! Next article"Cincinnati is still Cincinnati without BK"